The Vancouver blanket is a great addition to your collection. It's perfect for throwing over surfaces you want to keep clean and dry, enabling you to play just about anywhere your heart desires! When all is said and done, just toss it into the laundry and go on about your day! Great material, well-made, rich color. The Vancouver blanket is designed to keep the messier side of intimacy at bay. The 30" x 27" blanket is perfect for draping across a couch, chair, seat of a car, or the bed. It can be used for solo play, couple play, or group play. It's lightweight, folds nicely for packing, and can be machine washed and tumble dried on a low setting. Do not use fabric softener, ever. This reduces the absorbency of the material, as the fabric softener will coat the fibers, essentially making them water-tight. You can use vinegar; it will soften the fabric and lock in the color. The blanket is smooth to the touch on the top and the bottom has a slight woven texture. The material is super absorbent with all liquids, from lube to water to body fluids. This will come in handy for those who don't mind playing while menstruating. This blanket is not designed for you distance squirters out there; it will only cover a portion of the surface on which you may be playing. It's a great addition to your collection if you're wanting to lay something over your position furniture for faster clean up after play. It comes packaged in a plastic bag; there are no tags and no instructions. The top of the blanket appears to be similar to micro-suede, while the bottom is rayon or a polyester blend. In between the top layer and the bottom layer are two absorbent layers to hold excess moisture. When you're done playing, simply remove the blanket and toss it in the laundry. 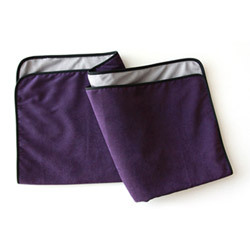 The blanket comes in black and purple; both colors will show stains from body fluids until washed, which lessens its discreet factor by three. It's pretty hard to hide what purpose it serves if everyone can see the evidence afterward. The company who makes this offers a larger version in a true throe size, so if this blanket doesn't suit your needs due to its size, there is another option available. The material is of a high quality and everything is stitched together perfectly; there are no uneven seams, wonky or loose stitching to speak of here! I really like this blanket. I was never interested in the Liberator pieces because of the pile - it seemed like it wouldn't be very absorbent or comfortable against my skin. I always had the impression of "wet dog/wet carpet" stamped in my mind whenever I saw them, so when this became available I snapped it up! I'm really glad I did. We have black sheets, and spot cleaning and/or laundering every other day gets really old after a while. Now that I have this, it's easy as pie. In my experiments I dumped an entire cup of water on top of the blanket, about 12 ounces total. It took about fifteen seconds for the liquid to become completely absorbed, but the counter top underneath was completely dry, as was the underside of the blanket. This thing can really hold a lot of liquid! It took about forty-five minutes to dry completely on a low setting. great review, I want one. Wonderful review helpful note about the vinegar thank you! Thank you for viewing Vancouver blanket review page!